e.l.f. Intense Ink Eyeliner quick-dry formula instantly enhances the lash line with rich and long-lasting colour. The felt tip pen allows you to create a sleek or bold line with complete precision. It glides on smoothly without smudging, feathering, or running! Ingredients: Water (Aqua), Styrene/Acrylates/Ammonium Methacrylate Copolymer, Polysorbate 20, Ethyheyl Palmitate, PEG-40 Hydrogenated Castor Oil, Xanthan Gum, Benzyl Alcohol, Methylchloroisothiazolinone. MAY CONTAIN: DC Black #2 (CI 77266). My favourite eyeliner I've ever tried. I get a perfect wing almost every time. It also didn't dry out for over a year. I don't need to try any other liquid liner because this felt tip works perfectly for my eye shape, its holy grail status for me. Great for beginngers using liquid eyeliner. Wish it had more staying power. Love it!!! Amazing for the price. I was looking for a vegan non-waterproof liner, and this is it. So affordable, I can't believe what a find that was. It's so easy to apply and makes the perfect line every time. It stays on all day, but washes of easily with soap and water. Highly recommended! I love this. I have never tried one like this before and it works really. This was great the first several times I bought it but the last 2 were not. It didn't last long and the paint on the outside container started coming off and I would have black spots all over my hand. Thought maybe I just happened to get a bad one. The last one I bought was not an intense colour at all and it smudges. First time using a liquid eyeliner pen and I'm very impressed! Stayed on, didn't smug, crack, or peel, and came off with ease. Just another awesome e.l.f. product. Easy application, long lasting and great coverage. I love this eye liner. So easy to control and wears like iron. Great, great value for the money. I have had mine for several months and still going strong with being used every day. This is by far the best liquid eyeliner that I ever used. It is so easy to apply and last entire day. I will recommend this product to my friends and buy more myself. I hate this eyeliner. It's terrible. When it is labelled as "intense ink" I expected it to be intense but it's not at all. It's not sheer but it's not intense. The tip is to long and it runs out after the first 2-3 uses. The eyeliner looks patchy and if you go over it the previous eyeliner Marks will flake off or crumble. This lasts all day and is waterproof. The felt brush tip is amazing, it makes it so easy to apply and I have horribly shaky hands! Love it on how it goes on. Amazing! I've tried both expensive and inexpensive eyeliners in the past; this one exceeded my expectations and will be my new go-to! This eyeliner is amazing. The tip is so fine you can get closer to your lashes than with any other eyeliner I've ever used. And it's not messy at all...only goes right where you put it. It's in my makeup box with all the higher brand names! This is my first time using felt tip pen . 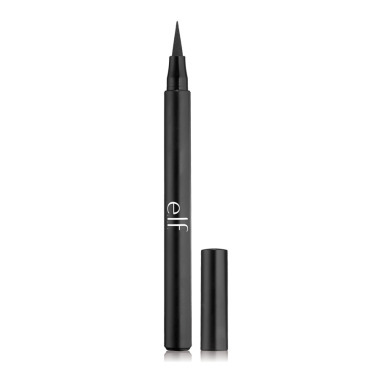 This pen eyeliner looks natural and easy to use. It is better than my high end brand liners . I would purchase this product again.